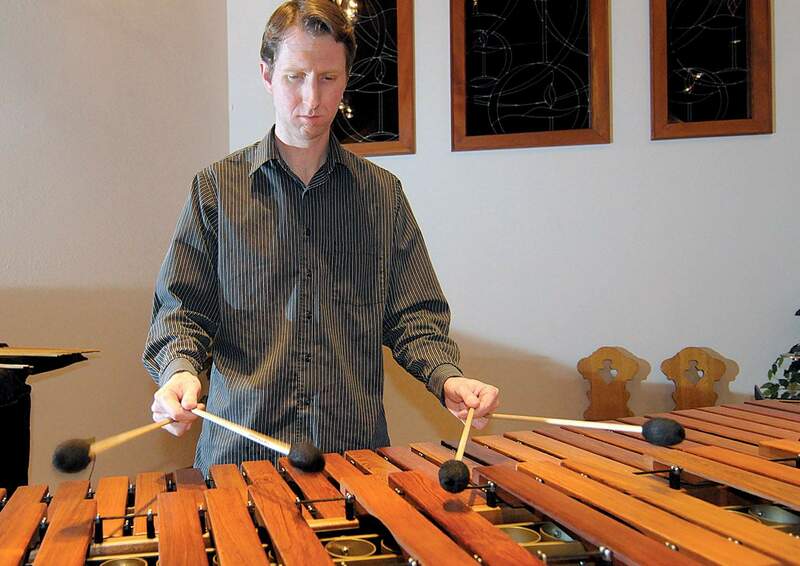 Jonathan Latta, assistant professor of music at Fort Lewis College, practices for a percussion concert that he gave at the Unitarian Universalist Fellowship of Durango. It takes three hours just to pack up, move and set up his instruments for a concert. Most musicians need an instrument to make music. But for Fort Lewis College assistant professor Jonathan Latta, the world is his instrument. At least thats how it seemed Friday night during his recital for a crowd of about 85 at the Unitarian Universalist Fellowship of Durango. We enjoyed the finished product, but about two months earlier, shoppers at the La Plata County Humane Society Thrift Store got a preview of the piece, Table for One by David Noon, that had the crowd abuzz. Ably assisted by senior music education student Michael Morris, Latta made a dinner table setting ring, chime and purr as he waited for service at a restaurant. I had to go up and look at the musical notation for the piece afterward, and I was just one of many audience members who also wanted to check out the instruments up close. Latta said he tried every piece of tableware and glass at the thrift store to get the right range of tones and pitches for the piece, which is the kind of thing one has to see and hear to appreciate. Im not a talented enough writer to describe the creativity of both the piece and the musician in pulling it off, but it was both impressive and fun. A percussionist extraordinaire, Latta tackled a wide variety of musical numbers, beginning with Bach on the marimba. Yep, youre awake, and you read that right. He said the marimba was recently extended to a low C, giving the instrument a five-octave reach, the same as a cellos. In fact, he actually used the cellos score on Bachs Suite No. 1 in G-Major for Cello (BMV 1007), commenting to me later that cellists give marimba players a hard time, saying cellists have the challenge of constantly having to retune. Lattas comeback is that while its true he doesnt have to retune nearly as often, he does have to keep moving throughout the piece, because two notes that are a string apart on a cello are 3½ feet apart on the marimba. While the Bach was certainly lovely, I have to say I preferred the pieces that were specifically written for percussion, an oeuvre that is still in its youth. Latta said he and his colleagues are always begging, borrowing or stealing from other instruments material. Another great thing about percussion is the sheer variety and number of instruments in the discipline, with versions hailing from every part of the world and every age of man. Drums are, after all, considered one of the earliest forms of musical instrument. Latta said its an unending challenge to learn them all, and he has a bucket list of different percussion instruments he wants to learn to play  its a good thing hes a quick study. Latta treated us to a piece called Inside the Shining Stone, using crotales, or ancient pitched cymbals that originally hailed from Mesopotamia, written by a composer he knows at the University of Central Arkansas, Blake Tyson. The lyrical beauty of Echoes, on the marimba, by composer Kevin Bobo, a professor at the University of Indiana, was a clear crowd favorite. I found the second movement of Robert Maggios Songs from the Wood, called ballad in rosewood and a little starlight, to be the most magical of the evening, still a melody haunting my memory three days later. So I had to ask  is the marimba actually made with rosewood? The answer is yes, Honduran rosewood, and therein lies a quandary. It is an ecological and economic topic of great debate among marimba players, as the tree comes from a rainforest, which is delicate at the best of times. As the very finite resource becomes scarcer and more expensive, there is no Plan B wood waiting in the wings that maintains pitch the same way, is as tunable or has the resonance of rosewood. On top of the overall scarcity, many marimba players play with such force they break the bars, requiring replacements. There goes more rosewood. While the last piece on the program was titled Prelude I by a young composer named Robert McClure, it ended up being a rousing send-off. Ive been thinking a lot about mentors since I wrote a story about Big Brothers Big Sisters of La Plata County, so I had to ask Latta how he came to play percussion. He mostly credits his mother, who often played her fathers Buddy Rich records, for exposing him to the excitement of rhythm. But it was his fourth-grade music teacher who truly set him on his path. I must confess that I often sit where I have the best view of the percussion section at orchestra concerts because its such a show. Latta said one reason hes good at shifting from instrument to instrument is because he spent several years playing in musical theater. Musical blocks, cymbals, cow bells, the triangle and timpani are just a few of the instruments hed play with each performance. Ann Smith and Susan Koonce coordinated a reception with quite a goodie spread after the recital, where guests couldnt decide whether to talk about Lattas performance or Juanita Ainsleys art, which had just been hung in Bowman Hall at the fellowship. Wow  paintings that look like collages. Judith Reynolds tells me Ainsley will have a show at the Fort Lewis College Art Gallery in the future. I highly recommend you keep an eye out for that opening. This was the third in the four-recital series. Topping it off for the year will be series organizer Marilyn Mangold Garst at 7 p.m. April 5. She will be presenting an entire recital on the harpsichord, a rare treat indeed. Feeling their New-Age sides emerge as they celebrate their Aquarian birthdays are Mary Jo Paxton, Wynn Berven, Randy Swan, Terry Swan (no relation as far as I know), Thomas Boness, Jim Williams, Marjorie Cornwell, Sarah Phelps, Nita Anderson, Kevin Martin, Savanna Safran and Linda West. Because Im not the only person pondering mentors, nominations are being sought for an award that will recognize people who have a significant impact on young peoples lives. Big Brothers Big Sisters of La Plata County is teaming up with San Juan Basin Health Department to honor adult role models. Anyone 21 and younger can nominate an adult who inspires them to be a better person. Categories include Durango, Bayfield, Ignacio, Latino role model and Native American role model. Nominations are due March 15, but just like anything else, kids, its better to get it done sooner rather than later. Nomination forms are available at www.sjbhd.org/en/nominate-an-adult-role-model. Since I know my readership trends to the over-21 crowd, if you hear your child quoting a favorite teacher, coach or neighbor, show them this item and encourage them to take a moment to acknowledge how much that person means to them. My apologies to Diane Wildfang, for leaving her off the list of Womenade Council members in my story about the Womens Resource Center in Saturdays Neighbors column. Anne Swisher, the Volunteer of the Year honoree, was quick to note that Wildfang just joined the council earlier this month. Theyre lucky to get her. Wildfang has been a mainstay of the philanthropic community ever since she moved here. Thrilled that the weather is no longer Arctic cold for their anniversaries are Shep and Sarah Shepherd and Lou and Gay Kiene. I am happy to consider photos for Neighbors, but they must be high-quality, high-resolution photos (at least 1 MB of memory) and include no more than three to five people, who must be identified left to right.